Yesterday was Corpus Christi, or the Feast of the Body and Blood of Christ. The Eucharist, or Holy Communion, is central to our Catholic identity. It is the `source and summit` of our faith life and liturgical worship. Sadly, the theology surrounding this sacrament separates us from other Christian denominations. Ironically, it also divides us within our own Church. When we receive Holy Communion under the appearance of bread and wine, we believe that it is really and truly the body and blood of Jesus and not just a sign or symbol of remembrance. We use dense words such as transubstantiation to try and explain the unexplainable. As with most mysteries, there are many layers and meanings beyond this core belief. Our theological or ideological leanings often determine which aspect is highlighted in our worship style. At the risk of over-simplifying or generalizing, traditionalists focus more on the real presence of Jesus in the consecrated bread and wine. Liberals or progressives focus more on the communal banquet table that feeds and unites us. A focus on the real presence tends to place great importance on devotional practises and liturgical rites such as Eucharistic Adoration, Benedictions, and Corpus Christi processions. Individual piety and acts of devotion center on the Tabernacle and the consecrated host itself. It can be more exclusive, with high standards of who can and who cannot receive. 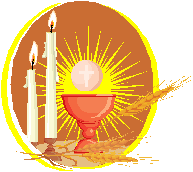 A focus on the communal aspect of Eucharist focuses on gathering in fellowship around the table of the Lord. The worship style is less formal and more communal, less focused on the person of the priest and more focused on the community. It tends towards inclusivity, with a desire to welcome all who come to the table. A previous pastor used to focus on the real presence. His strong devotion was apparent in both his worship style and homilies. He often wore a Cope, a liturgical cape, changing vestments mid-way in the mass. After Communion, he dramatically kneeled in long prayer in front of the Tabernacle while we watched from the pews. Lengthy rules concerning reception of the Eucharist were repeatedly read in homilies and printed in bulletins. We had to bow – and he kept correcting how we bowed. He preached that the most important place in the world was inside the four walls of the Church. Missing Mass was a grave sin. One First Communion Sunday, when pews were filled with non-Catholic family and friends unsure of when to sit and stand, he preached about Eucharistic miracles – hosts purportedly turning to real flesh and blood. I squirmed in the pew wondering what our visitors were thinking. What were the young boys and girls thinking? At the heart of his efforts was a deep devotion. But his methods were turning people away rather than drawing them in. As with many aspects of our faith, the truth can be found in the middle of two extremes. If we truly believe in the sacramental presence of Jesus in the Eucharist then yes, we must receive with respect and devotion, ensuring that certain standards are in place. If we truly believe that it is a sacrament of love and unity, then we must also reflect this in how we welcome our sisters and brothers to the table. Yesterday, our pastor told us in his homily that the Eucharist will be even more sacred now because only a priest or deacon can open and close the Tabernacle doors. My stomach turned upside down at that moment. That was after the deacon’s wife told us we couldn’t sit in the front pew because that is for the commentator and lector, like I didn’t know!??!?! She saw our daughter ask me if we could sit there. She also practically accosted three people as they attempted to sit there. I thought, “what if they have not been to church in a while, and this is the way they were welcomed back.” I know what’s truly in my heart, but frequently the emotion takes the lead. Oh my, Chris….I`m joining you in the communal stomach flipping! It`s sad when well-intentioned and devout folks become so obsessed with rules and regulations that they forget the true Body of Christ…God`s people. Is the tabernacle rule a diocesan one? I haven`t heard of it. I know Joanne forwarded Francis’ email to you regarding the piece of Eucharistic bread he found on the floor. room for all, and diversity gets incorporated and becomes “Catholic”. side of wideness of our Catholicity. the utmost of reverence, respect, and devotion, as the real presence of the body and blood. There is no way to prevent occasions where it appears someone may not have offered this same reverence to the Eucharistic elements.We do know that the power of God can handle these things, even withdraw the divine presence. tell other starving beggars where to go to get this nourishment. has happened my thoughts are: “they are not worthy; neither am I”. family gathering in our home. worthiness, and no power and control were needed. Let’s make the table bigger! Chris, we will never have to worry about the death of clericalism in the Church as long as we have people like your deacon’s wife to step in and raise the banner. But it seems to me that “defending the faith” is about debating and positioning. The focus is on rules and regulations. I would rather families sent their kids to learn more ways to “live” their faith. You`ve given me a great idea for a blog, Marceta. Thank you!